There are no lockers in the hallways at Beaver Country Day School. Instead, backpacks and tote bags line either side of the floor while students step over them during the mid-morning rush to class. Nearly everyone is carrying a laptop. You can also get this as a podcast. "Although educators tend to feel like they are left all on their own to deal with students that are getting crazier by the day, there are plenty of technology resources that can make their teaching job more effective. Educators should definitely start using some of the online solutions that are meant to promote modern education and take the classroom organization to the next level. In this article, we will cover 20 education technology tools that educators should start using as soon as possible." @jenniferacronk @jlubinsky @alicebarr @jcalvert4 SO glad you were decluttering. These posts made me smile today! Happy 5th! By @sylviaduckworth Click here to see a sample story. short link to this doc: http://goo.gl/2f0bX The "Awesome Tables" gadget can be used to create a table from a spreadsheet and add interactive controls to manipulate the data it displays. They came to her, over roads and over rivers, for inspiration, for guidance, for work. She is Surayia Rahman, a self-trained, passionate artist who guided hundreds of underprivileged women in Bangladesh to create masterworks - exquisitely embroidered nakshi kantha tapestries that have been gifted to dignitaries and are admired in collections throughout the world. It's been a fabulous filled day! Every day, veteran educator Scott Henstrand walks into his history classroom at the Brooklyn Collaborative Studies secondary school, jots down a few conversation-starters on the blackboard, then takes a seat amongst the 14- to 17-year-olds. Groton- Dunstable Regional HS was the venue for Cloud Camp New England on Saturday, November 9, 2013. It was a lovely venue, and attended by a wonderful group with loads of energy! I loved the size of the group. It's always fun to meet teachers who are implementing Google Apps for Ed in their schools. Thanks to Andy, Audra, Julie, and Kelly, the crack IT team at the school, for hosting this event! Digital Fist Bump to @WickedDecent for moderating the Best Hour in ME Education since Geek of the Week @ACTEM. #edchatme And thanks to GSP! "The most popular site among all teens now is YouTube, according to the report." "Implementing High School Emergency Preparedness While Staying True to Your Culture"
"If it seems like your kids are constantly plugged in, tapping away on their iPhones, obsessively gaming and SnapChatting way more than they're actually ... chat-chatting -- well, that's because they are. It's estimated that children ages 8 to 18 spend an average of seven hours a day behind screens; teens send an average of 3,417 text messages each month; and 97 percent of adolescents have at least one electronic device in their bedrooms." Connected Classrooms is a program from the G+ Education team to provide teachers with the resources to connect their students with experiential learning opportunities, like virtual field trips, on Google+. With internet access, webcams and inquisitive minds, the possibilities are endless. "GamePress is a game creation app that allows anyone to make the games of their imaginations with no programming or graphic design. Whether you have a story to tell, a topic to teach, or just want to play a game, GamePress allows you to create, share, and play right on your iPad. GamePress is fun, creative, and entertaining. GamePress is great for beginners. If you’re new to making games, our interactive guide will help you make your first game in minutes! GamePress includes all the necessary tools to create the games of your imagination." "We can assess creativity—and, in the process, help students become more creative." 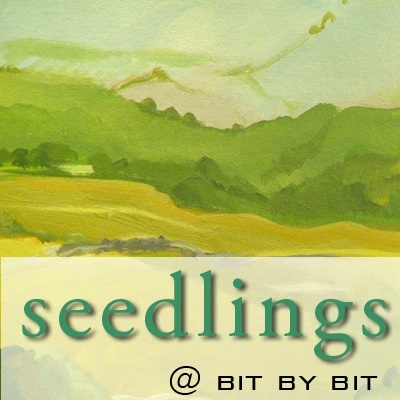 The guide includes ideas and directions for using Padlet, Socrative, and TodaysMeet. You can download the guide here and view it as embedded below. Reflection on Honduras and "One Laptop Per Child"
I had the opportunity to participate in a teaching exchange in Honduras on October 12 -18. 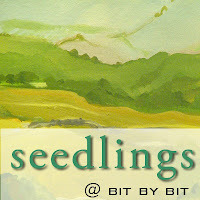 I was part of a team of 5 educators from The Maine International Center for Digital Learning. The team was Cathy Wolinsky (Yarmouth Elementary School), Laura Girr (Freeport Middle and High Schools), Abby Manahan, and Amy Wilmot (MICDL). Former Maine Governor and Senator Angus King and Bette Manchester founded MICDL in 2008 to support the development of promising educator practices, digital student resources, and international programs. MICDL works to create and sustain networks of educators, communities, international organizations , and university/school partnerships to promote technology-driven tools to personalize learning, encourage collaboration, and prepare students for the future. We have many visitors come to our high school to see our laptop program in action. I have written about this before. Representatives from Honduras and Surinam came last spring. The team included the Under Secretary for Technical Affairs of Pedagogical Education, Elia Del Cid and 2 members of the EduCatrachos Team, Patricia Rivera and Donaldo Ochoa. I was impressed with the questions they asked about 21st Century learning techniques and their commitment to professional development. Their pilot, which started in February 2013 in grades 3-6 , involves 70,000 OLPC computers running Sugar and Fedora (which allows them to connect to the internet). It is financed through the International Development Bank. 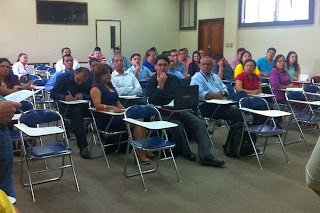 The EduCatrachos Team invited us to come for two days of teaching and 2 days of attending a technology fair. Our role in the training was to share pedagogical strategies, support the integration of technology in areas of literacy and numeracy, as well 21st Century Skills such as leadership, problem solving, and creativity. We tried to prepare as best we could. The language barrier for preparing something like this was significant. Luckily Laura speaks Spanish, and the translator who had been with the team in Maine, Chris, helped us with planning. We really didn't know what prior knowledge and experience using technology to expect from our "students". At the time, we didn't know if there would be internet access or what version of machine they would be using. Thankfully, David, a member of the EducaTrachos team was at our hotel upon arrival with machines for us to learn on and his patient explaining made us feel better prepared. We also created a website to use with our participants. We met our translator, Diego, a college student who ironically had visited Portland, Maine as a child. For 2 days we met with about 45 teachers from Honduras, each picked as the technology lead for their school, They came from all over the country to attend. 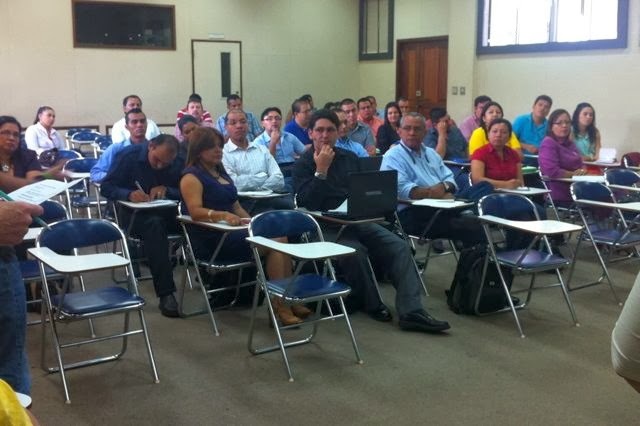 Also attending were 3 teachers from Panama, and 2 from El Salvador. Each module was introduced without technology and then enhanced using technology. One of our overall goals was to build a collaborative group that would stay connected after our time together. We started in nice straight rows and by the end of each day we had messy groups all around the room. Listening to the chatter and excitement made us think that this group will definitely continue their learning virtually through Facebook, Diigo, UStream, and other online tools. Days 3 and 4 were spent at Chiminike,The Children's Museum, in Tegucigalpa. A wonderful celebration of student work, there were booths set up showing various school projects. Students used recycled materials to create puppets. They then made narrated videos of their puppet shows. Some were about teaching how to recycle. 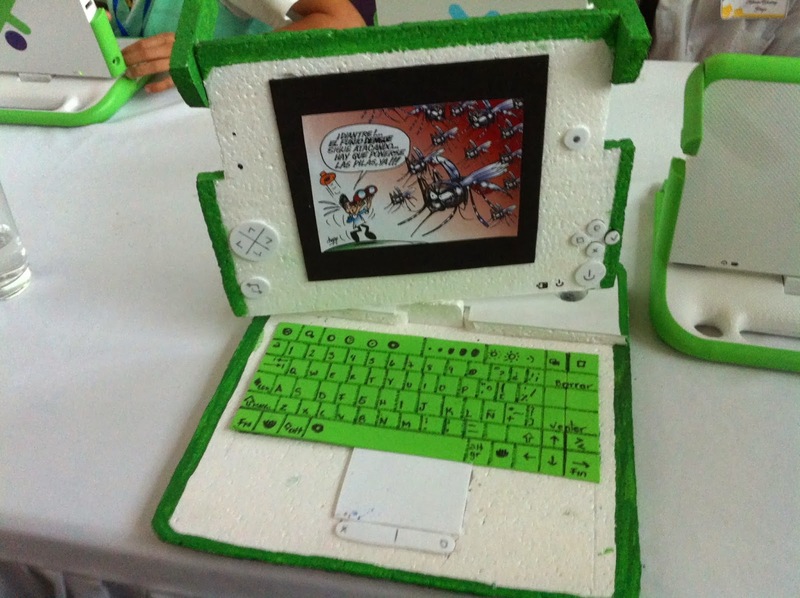 An exhibit on Denghe fever even had an OLPC laptop made out of styrofoam to take in to their community. Students are not able to take their laptops home. Many students were using Scratch programming and Lego WeDo robots. There were robots everywhere! We saw many teachers being taught by students and many students working in small groups. The group from El Salvador did a very nice activity around introducing robotics to the teachers first by making circuit boards and hydraulics using syringes. Next teachers put things together and then finally they introduced the robots. We presented our activity on storytelling and we presented our information about the Maine Learning Technology Initiative in Spanish. While we were presenting, students were videoing and taking pictures with their laptops. 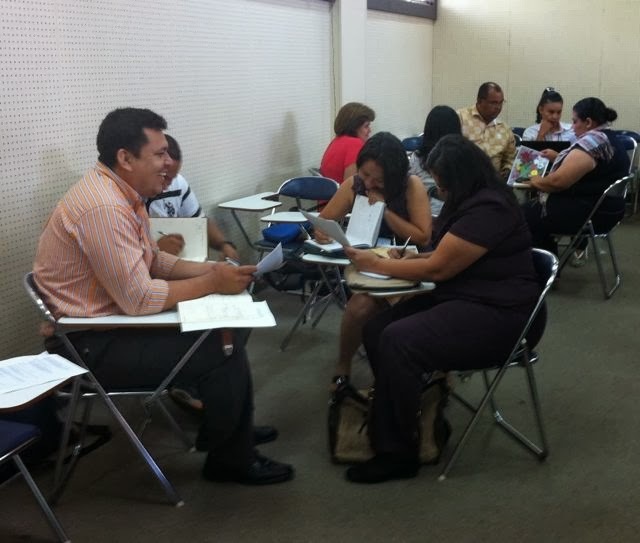 I really enjoyed working and learning with the students and teachers of Honduras. 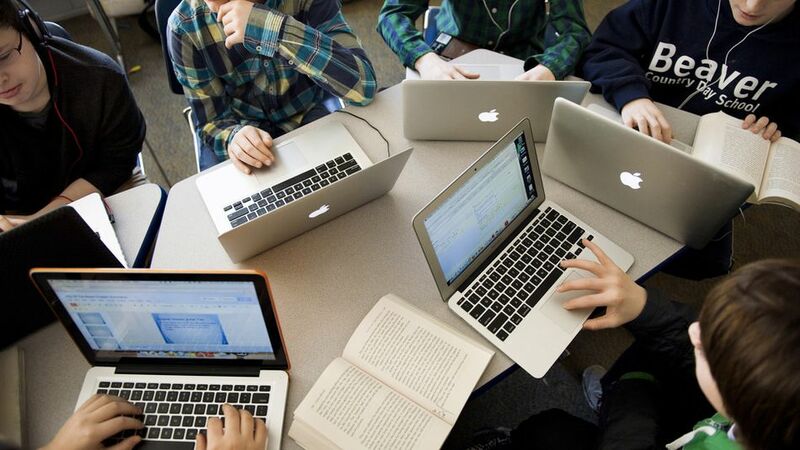 They have fully embraced new ways of learning using technology. The EduCatrachos team is amazing. Their knowledge and support services are critical to making the program a success. Every morning the latest information was posted at their website. They call and check in with each school once a week. They were giving individual support the entire 4 days. They know the machines inside out and were available to troubleshoot. As they finish year 1 of their project, I wish them all the best and success for the future! If you would like to see more pictures, my Flickr set is here. More pictures will be added to this group as well. "Google Earth's Street View, 3D imagery, and historical imagery is good for showing students what London looked like in the 20th Century and today. But if you want to show students what London looked like in the 17th Century you'er going to have to go looking for some historical maps and drawings. Or you could show them this award-winning animated tour of 17th Century London. Pudding Lane Productions created the three and one half minute video tour to show viewers what London may have looked like prior to the Great Fire. The tour is based upon historical drawings and maps that the Pudding Lane Productions team researched. The video is embedded below." "This TED Talk style video was created to inform students on effective presentation tips and techniques. This presentation was filmed and documented to help students prepare for their very own TED Talk projects in school. The presentation, filming, and video editing were all created by Bradley Lands, with the help of one student operating the main video camera." In no particular order, we have listed all the coding apps that are appropriate for young learners. We've used many of them with elementary-aged students. "They’re not just tweeting, snapchatting, and Facebooking. Okay, maybe that’s what they do most of the time. But modern students are doing some pretty innovative things with technology these days. From blending up all their online and offline courses to integrating iPads into activities outside the classroom, there’s a lot happening that you should know about. " I love it when students teach the teachers! The Lexile ® measure of text is determined using the Lexile Analyzer ®, a software program that evaluates the reading demand—or readability—of books, articles and other materials. The Lexile Analyzer ® measures the complexity of the text by breaking down the entire piece and studying its characteristics, such as sentence length and word frequency, which represent the syntactic and semantic challenges that the text presents to a reader. The outcome is the text complexity, expressed as a Lexile ® measure, along with information on the word count, mean sentence length and mean log frequency. "How often do you take selfies — pictures of yourself, with your cellphone camera — and send them to someone, or post them on social media? What kind do you take, and what reactions do you usually get? Why do you think there has been such an increase in this kind of picture-taking in recent years?" Share book reviews and ratings with Alice, and even join a book club on Goodreads.